First thing’s first—with any audio issue, you have to identify what it is in order to treat it. Is it distortion? Hum? Noise from a fan? Once you’ve identified the issue, the question becomes: what tools can you use to treat the audio and get the desired sound? Successful audio repair often depends on the correct sequence of processing steps. For example, impulse noise repair algorithms like RX’s Mouth De-click module, should be run first, ahead of any hum or broadband noise reduction. 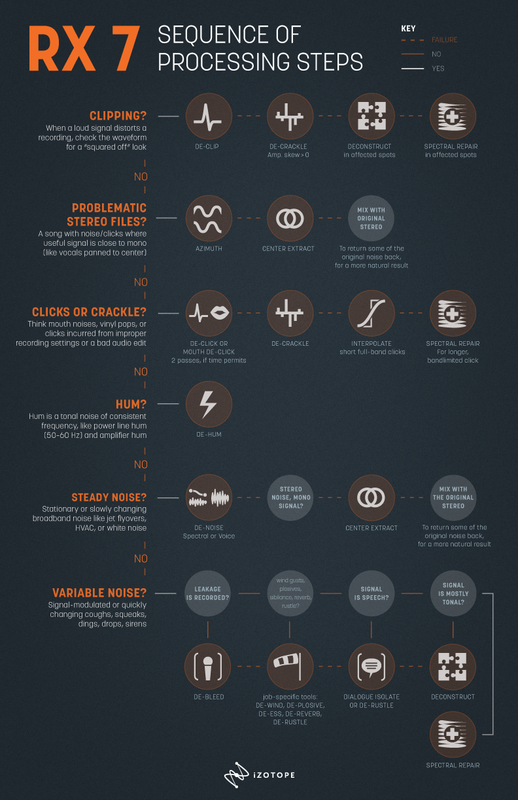 As a general guideline, we suggest this flowchart of processing steps for audio repair. For many audio restoration problems, there are multiple modules in RX that can be used alternatively or in sequence. Click here to open the chart in a new tab at full size. And with the addition of Repair Assistant, iZotope's intelligent repair tool, RX 7 can automatically detect noise, clipping, clicks, and more, helping you solve common audio issues quickly. RX 7's Repair Assistant will analyze the audio and offer different suggestions to help give you the best result. You can even see which processing chains and the order of the modules Repair Assistant used to treat the audio. Learn more in this video! Even the faintest click track or speaker bleed can ruin your recording. Use the De-bleed module in RX 6 to easily address these audio issues. Learn to identify the type of audio problem you see in the RX spectrogram in order to select the right audio repair tool for the job.